A few years ago a rumour appeared that Google was in the market to buy gaming giant Valve, ticking enough boxes to be given widespread coverage by the tech media. Principally it made a lot of sense – Valve, as well as being the company behind wildly brilliant games like Team Fortress, Portal and the doyenne of first person shooters Half Life, also owns the successful Steam delivery system. However despite a huge amount of excitement about the potential of a Google Valve tie-up it never came to fruition, but when Apple CEO Tim Cook was spotted wandering into Valve HQ, it's no surprise that the rumour mill started grinding all over again. Although you can't entirely rule out cash-rich Apple snapping up one of the greatest gaming companies around, it would be an extreme and seemingly unlikely move. More likely the two are collaborating on something. The rumour, of course, is that it could be gaming hardware, especially given the escalating talk that Valve is working on its own gaming box. This is, of course, hugely exciting. Valve, it could be argued, is the Apple of gaming. How do you reach this conclusion? 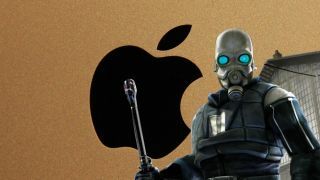 Well, like Apple, it has built its success on a number of power brands (the inimitable Half Life series, Portal and Team Fortress), it has become vital to third parties through Steam just as Apple has with its App Store and, perhaps most vitally, it is an immensely cool brand with a mass of fanboys. Valve also adopts a similar attitude to press; although the world knows it is working on the next Half Life you won't see any details about it and the company certainly won't be courting publicity for the product – mainly because the rumour mill does its work for it. The truth is more likely to be that its something to do with a current Apple brand; it could be a game for iOS, it could be Steam on the much-rumoured iTV, it could be some other form of streamed gaming or it could be that Tim Cook is merely gathering some knowledge from a few guys that used to work for Microsoft before establishing a gaming dynasty. But, for a little while at least, it's okay to wonder "what if ?" It's okay to talk about the Apple competitor for the Xbox and PS4 and fine to dream about Half Life 3 launching the system. Yes the truth is probably much more mundane. But when you have the Apple of gaming, and the Apple of, well, the world, meeting up it's also pretty good to have some fun with the news. Of course, if we see Google's Larry Page and Microsoft's Steve Ballmer turning up later in the week then we'd be okay with that as well.